Microsoft Arc Touch Mouse Review - Is It the Perfect Travel Mouse? 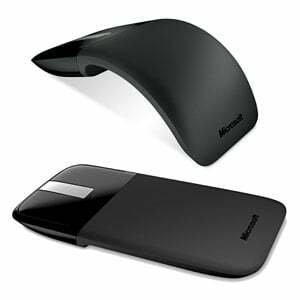 Today, Microsoft announced the launch of the Microsoft Arc Touch Mouse —a full-size mouse that folds flat for portability. The Arc Touch Mouse, which measures less than 15 millimeters at its widest point, easily slides into a briefcase, purse or pocket, making it the perfect travel companion for computing on the go. I first saw the Arc Touch Mouse at a Microsoft event back in June and received a review unit this morning. It's a great little product and one that I definitely plan to take with me when working out of the office. While not as comfortable as my regular mouse, it is far more usable than most other travel mice I've tried. Folding the Arc Touch Mouse flat requires a simple push. It turns off automatically when flattened and turns on again when popped up. A tiny magnetic snap-in Nano transceiver stores conveniently on the bottom of the mouse. 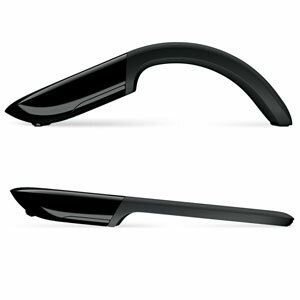 The Arc Touch Mouse features a "touch scroll strip", instead of a standard scroll wheel. The scroll strip uses a capacitive sensor pad to sense the movement of your finger and has three virtual tap “buttons” for paging up, paging down and a user programmable middle click area. The strip also uses haptics to provide vibrations that simulate the bumps you would feel while using a traditional scroll wheel. I liked the effect, finding it gave a very natural feeling, similar to that of a physical scroll wheel. However, the vibration also creates a clicking noise, which I could see annoying your seatmate on a flight or the person at the next table in Starbucks. Thankfully, it can easily be turned off, when necessary, through Microsoft's IntelliPoint software. The Arc Touch has standard left/right buttons, but no side buttons. Microsoft claims that the two AAA batteries give the Arc Touch Mouse more than six months of battery life, and a battery life indicator lets you know when the power is running low. The Arc Touch Mouse is available on Amazon.com for $45 .